It has been a while since we last spotted a Hercules moth here but yesterday morning a guest found this male on the verandah of their bungalow. 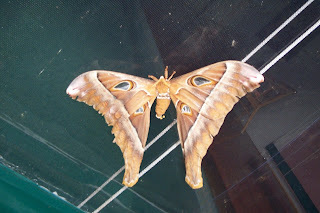 The Hercules is the world's biggest moth and can grow up to a wingspan of 27cm. The female is generally larger than the male - and this is quite a small male! This old photo (not to scale) is of a female, so you can see the difference in shape. An interesting fact is that the female lives for such a short time that she is actually born without a mouth. 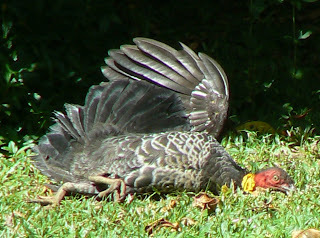 We have two semi-resident wild Australian Brush-Turkeys, nicknamed Heckle and Jeckle. We spotted Heckle (or maybe Jeckle!?) enjoying the sun the other day while we were talking to one of our guests - he immediately commented that it is so peaceful here that even the birds are relaxed! Another typical perfect winter's day in Far North Queensland - this morning we awoke to a valley full of soft white mist which soon disappeared and now the skies are clear blue and cloudless, with a forecast temperature of 26 deg C. Last night was a (for us!) 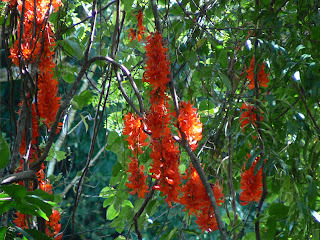 chilly 13 deg C.
This is the time of the year when the beautiful Flame of the Forest is in full bloom on the rainforest trees around the gardens. It is a vine which produces lovely bracts of waxy flowers - and the Honeyeaters and Lorikeets go wild for it's nectar. After a little recent rain the grass is a lush green and Peter will soon be mowing again - quite unusual for this time of year when it is normally getting very dry and the grass doesn't grow much! Stewart Creek Valley looking north towards Daintree Village and the Daintree River. Behind the rainforested hillsides Daintree National Park stretches in all directions.